You don’t need us to tell you that Pinterest is the place to go for wedding design inspiration. But it can give you ideas overload! In our 'Baya loves' blog series we’ll be sharing some of our favourite collections on Baya Pinterest boards, and seeing as we’re in Summer festival season, we’ll begin with festival wedding style! Here are a few of our favourite festival wedding Pinterest picks. Imagine a flock of origami birds hanging from a Baya dome roof! Magical. 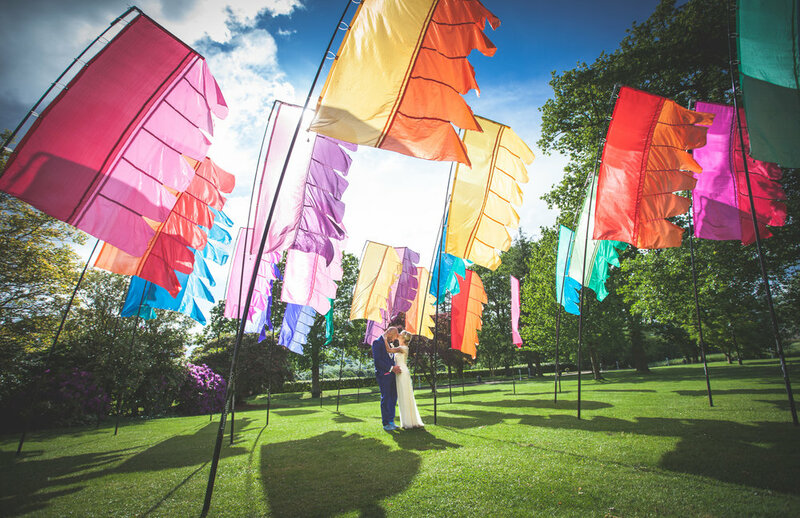 We love these fabulous Glastonbury style flags. And what an amazing photo opportunity. A brilliant idea for cooling and storing bottles and easily manoeuvrable too! Send your guests in the right direction towards a Baya dome with some festoon lighting. A firm favourite with couples in our Baya domes...elegant, simple floral displays stretching the length of our 6ft plank tables. You view our full Pinterest board below for some more inspiration below and view our gallery to see how other couples have styled their Baya weddings. You've set the date and now your thinking about your wedding budget. Just how much is your big day going to cost you?! In our 'Baya loves' blog series we’ll be sharing some of our favourite collections on Baya Pinterest boards, and seeing as we’re in Summer festival season, we’ll begin with festival wedding style! We know deciding on your wedding and reception venue can be a tough choice. But if our domes have caught your attention, take a look at the most common questions and answers for brides-to-be. For some, the thought of a DIY wedding can be overwhelming especially if you have zero experience in organising any kind of event. Don’t despair - we’re here to help. When Carla contacted us and explained her vision for her wedding we were really excited to be involved. The Venue - CandyLand Studios at Summerdaze Camping is an amazing place tucked away in the wilds of Devon, owned and run by a lovely family Lydia and Alex. After Kim and Mark came to have a look at our Dome with the Sail attachment at Tapely Park back in April they knew straight away that was the only choice for them. Could these be the most beautiful venues? We have received some amazing feedback from our clients that have chosen the Dome venues for their weddings this year and also some fantastic commercial clients such as CountryFile Live where the Double Dome was used as a restaurant. 2015 Wedding season so far! Here's a few images of a local intimate wedding we hired for in June, a great time was had by all. We are loving the kids table layout. We've just got a few shots back from the very talented Heidi White photograpy, all styling by the ladies at Blue Fizz Events and set in the brand new wedding venue 'The Barn' at the Milky Way Adventure Park. We have been throwing some ideas together on some awesome looking archways all made from reclaimed timber. Something along the lines of the pics below but with our own unique twist!